SLEEPS 5 BATHROOMS 2 BEDROOMS 2 Two master suites and one extra single bed and one cot available. 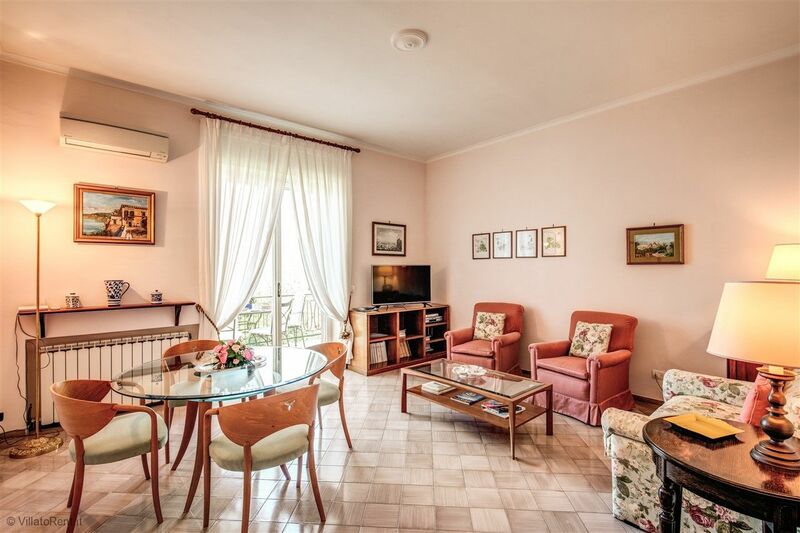 This attractive and well-maintained apartment is located on the second of a two floor Villa and is situated less of 200 mt walking distance from the town centre of Sorrento. 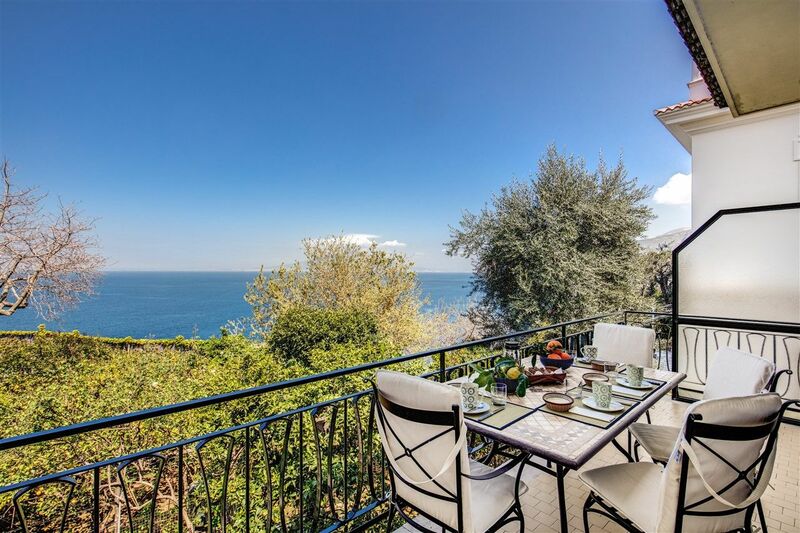 Surrounded by a beautiful Italian Garden and overlooking the Bay of Naples this property offers stunning views of Vesuvio and the Sorrentine Coastline. 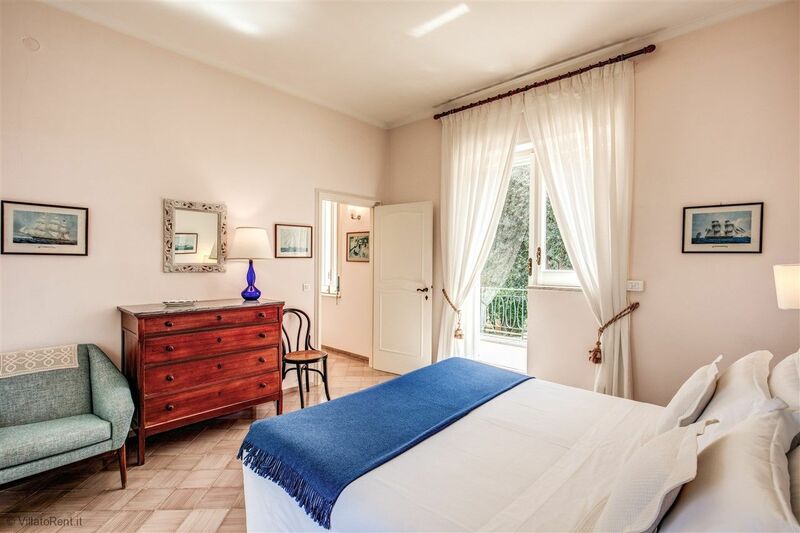 An ideal accommodation for a professional couple or a family looking for a peaceful corner to spend a quiet holiday.Villa Donna Elisa is located just a few steps from Piazza Tasso and Piazza Lauro. Surrounded by a luxuriant garden in the ideal location for visiting Sorrento and the many itineraries for discovering the Sorrento Peninsula, the water shed between the Gulfs of Naples and Sorrento, with Punta Campanella, which separates the Sorrento coast from the Amalfi coast.Sorrento is very well served by public transportation, both by land, with the light rail line Circumvesuviana (train st. just 200 mt. 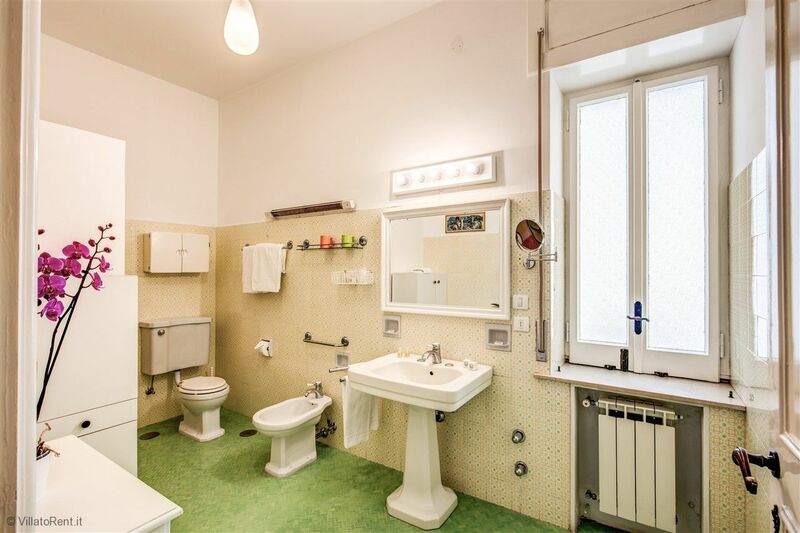 from Villa), which connects with Naples in 1h., the excavations at Pompei in 1/2 h. an 1 h. and those of Ercolano in 50 min., and by sea, with the direct Naples - Sorrento hydrofoil (35 min.) and the Metro del Mare that, from Porto Marina Piccola (where the hydrofoils leave for Capri and Ischia), 0.5 km from the Villa, with numerous boat reaches Naples in 45 min., Positano in a 30' and Amalfi in 1 h..The CTP buses for tourists provide a 24 h. connection between all main touristic points. 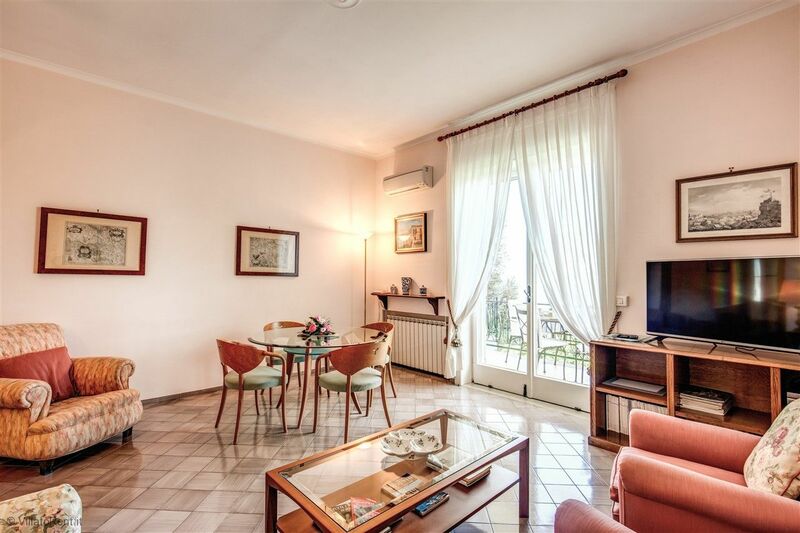 Staying at Villa Donna Elisa you will be able to visit Sorrento and the surrounding area in a very relaxed way, having as a home base a lovely apartment just out of the noisy centre. 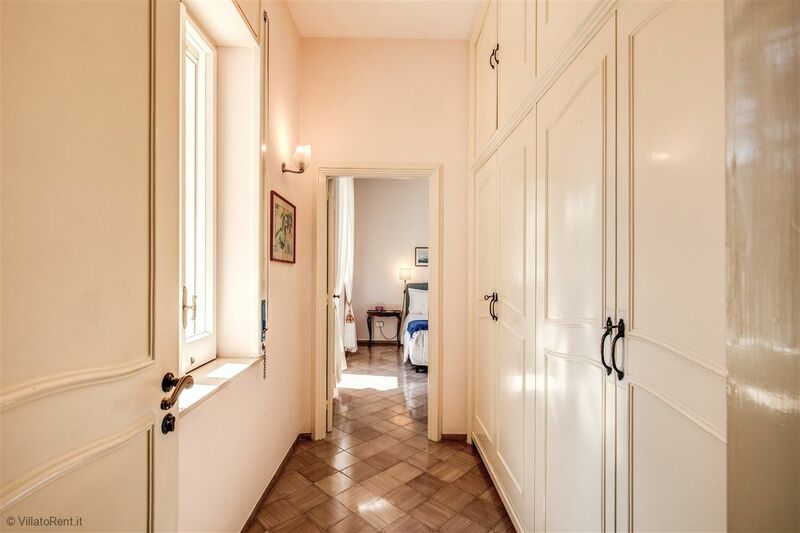 In a few minutes you will be able to reach the historical heart of the town, with its charming alleys, full of life and colors, its monuments, such as the cathedral or the Cloister of San Francesco, its beautiful gardens.He had several good reasons for choosing this spot, and it is for these same reasons that modern-day travellers are spellbound by this amazing villa. 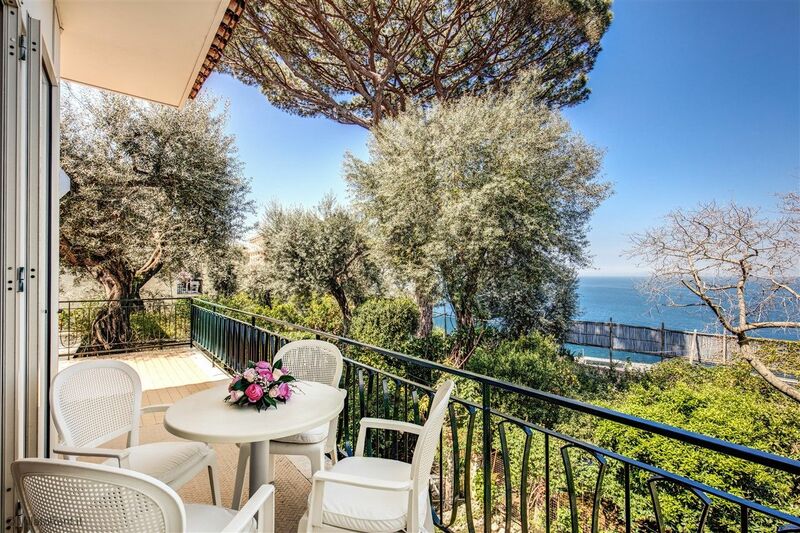 From the large and splendid terrace, placed directly above the sea, you will be able to admire the incomparable scenery of Sorrento and the tall cliffs that dive into the sea. And there are many more things to delight your senses, the mild climate, the perfume of flowers,oranges and lemons. 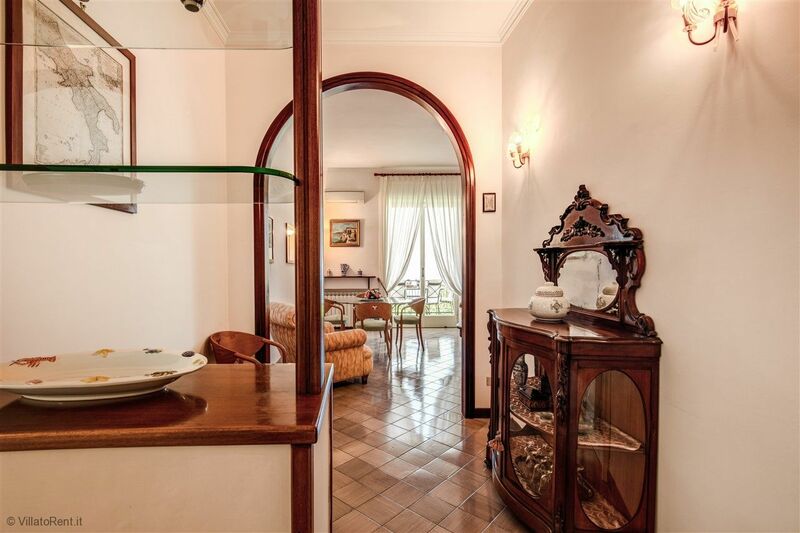 Every year we now make Villa Donna Elisa our holiday destination. We fell in love the first time we stayed and we dream of returning year after year! As a family we have traveled all over the World and have stayed in some of the finest hotels. 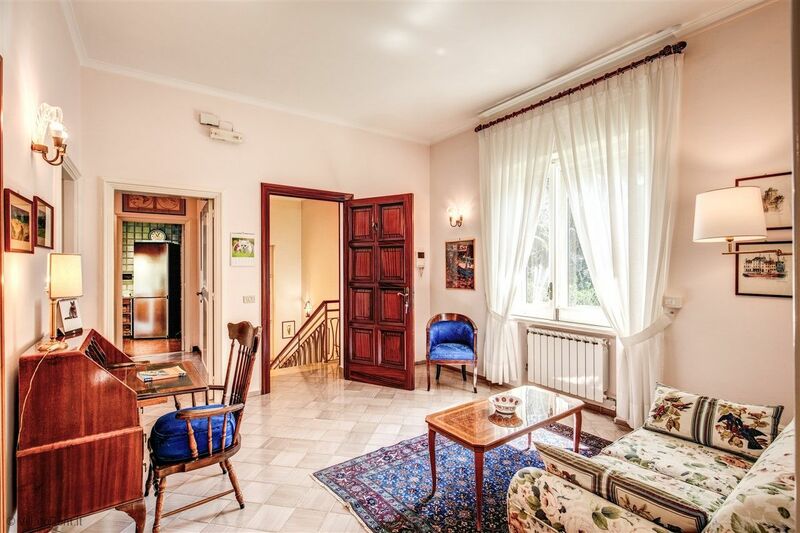 However, nothing compares to our stay at Villa Donna Elisa. 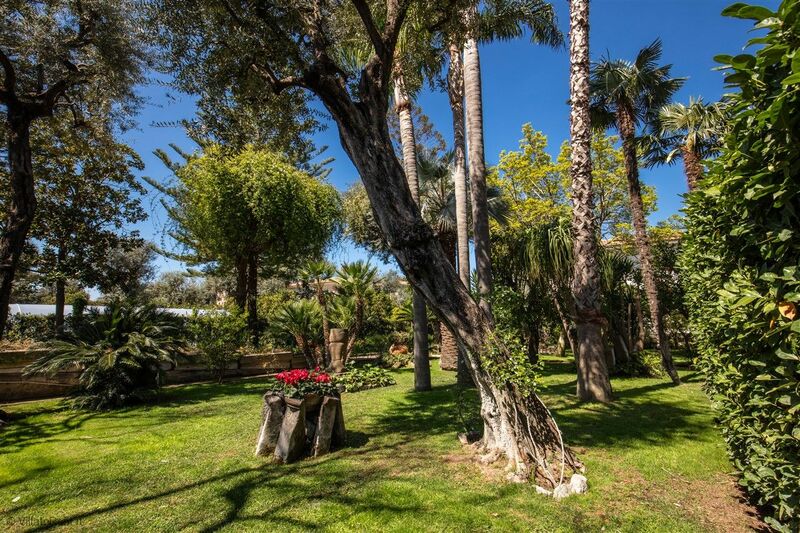 When you arrive at the property the gates open to such beautiful and enchanting gardens. Every morning we have our coffee on the terrace with such breathtaking views! 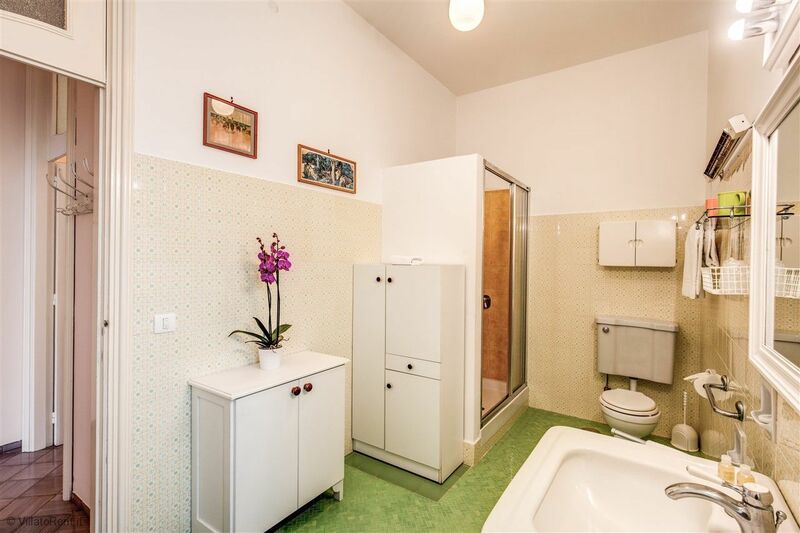 The villa is large, and always so pristine. Madame Elisa has become family to us now. We feel honored that she shares her home with us. A jewel that we cherish! Thank you again for another amazing holiday. We will see you again in July 2013! Thank you too Bruno! We are writing this with kindest regards and thanks to Madame Elisa, who was the perfect host/owner of this fabulous apartment. The apartment had the perfect combination of view, location and amenities. 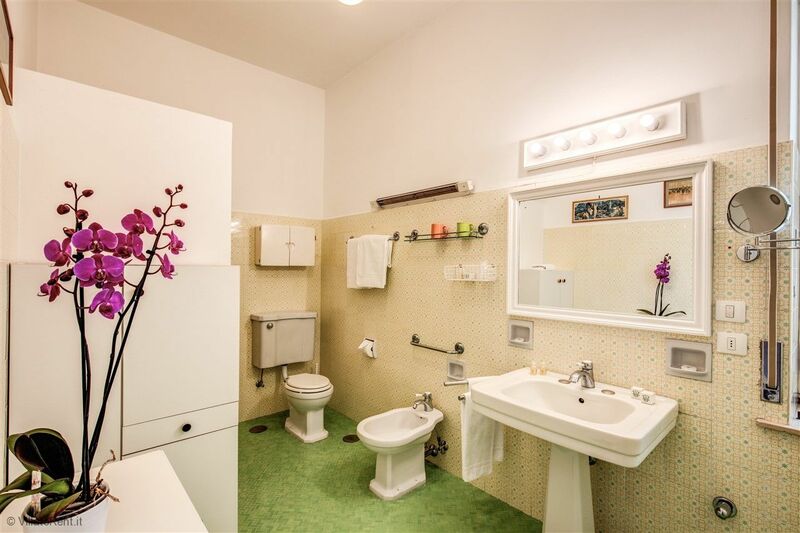 It was immaculately clean and maintained. Madame Elisa was gracious and a wealth of help and suggestions when requested, but always mindful of our privacy. Some of our favorite memories were our delightful conversations with her and tours of her beloved gardens. 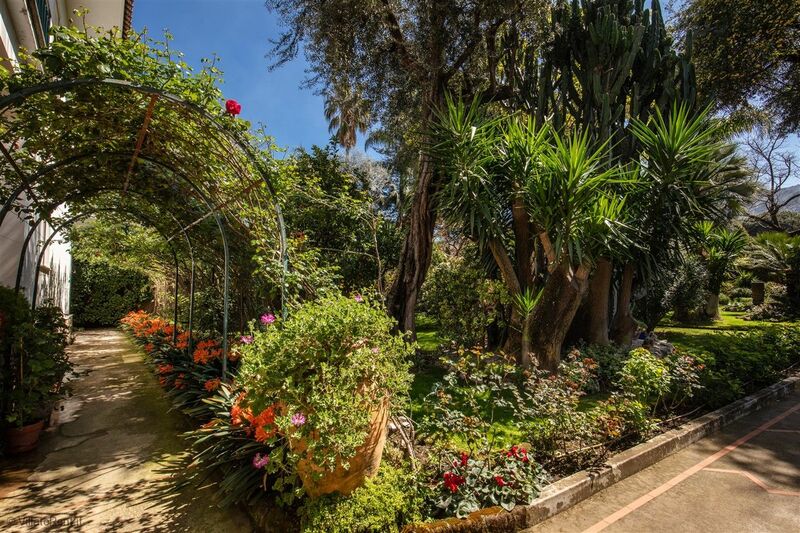 Although our visit was in November, the gardens were a delight and the views to Naples and Mt. Vesuvius were outstanding. 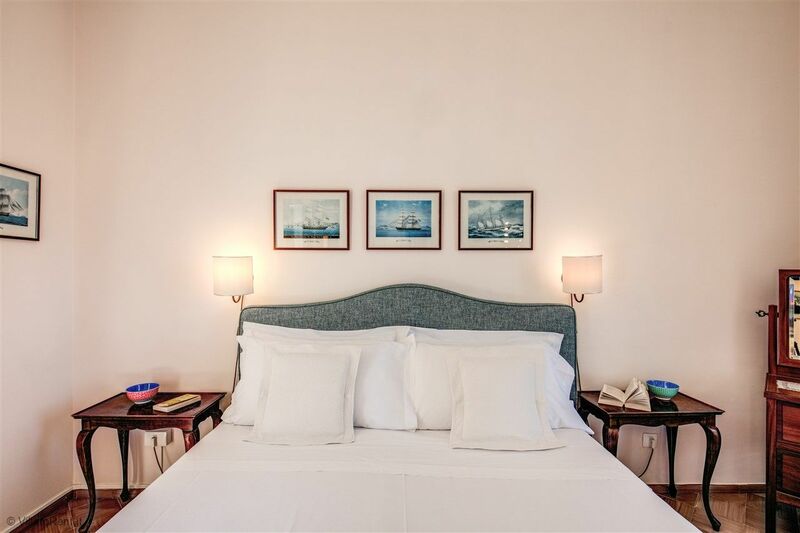 The location of the villa was perfect for strolls through Sorrento, taking a train to Pompeii and also a short walk to the hydrofoil to Capri. We arranged for a tour of Amalfi through Bruno wich was another highlight of the trip. Tony provided safe transport, good commentary of the beautiful coastal towns and a great lunch recommendation at San Giovanni's outside of Ravello. 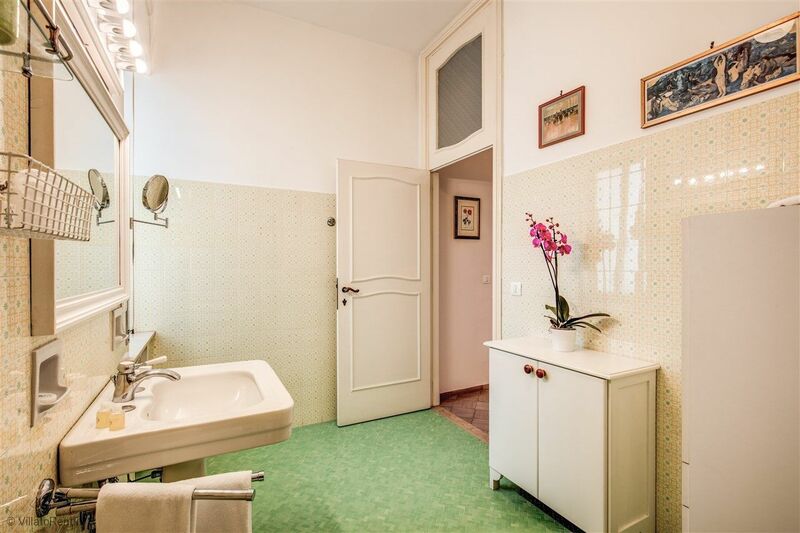 Do not hesitate to rent this property! Madame Elisa made our stay truly enjoyable. 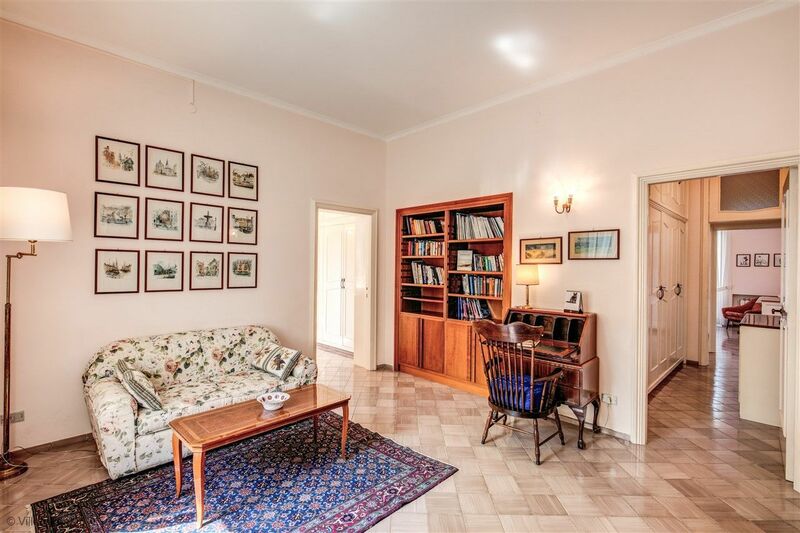 The apartment is large, comfortable and the floor plan is ideal for four people. 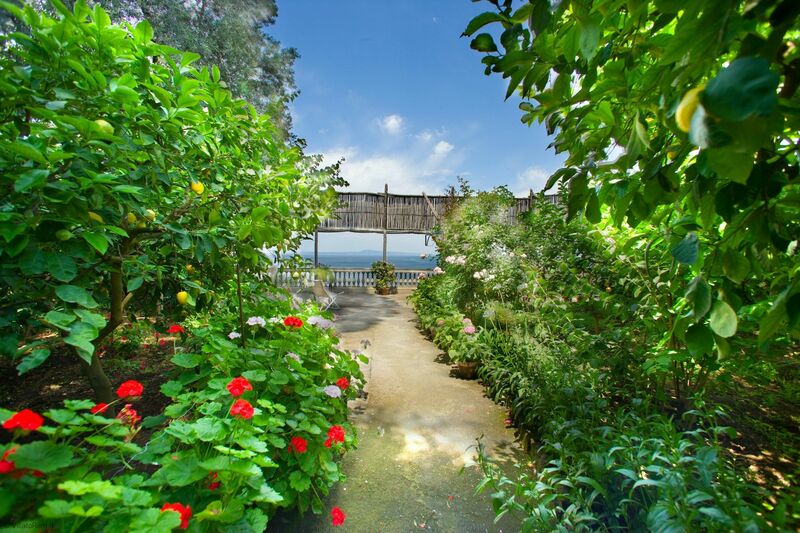 The view is breathtaking and the garden a little oasis of peace and tranquility. You can sit on one of the four balconies or the stone terrace that overlooks the port to wind down and relax from the day's sight seeing. 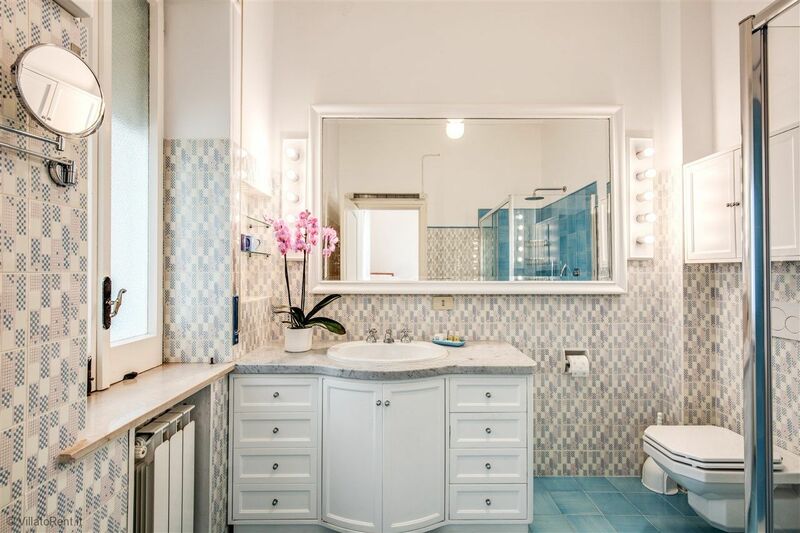 Speaking of which: the villa is very centrally located to reach the city center in a 5-minute walk and the Amalfi Coast (a must-see) by car or boat. 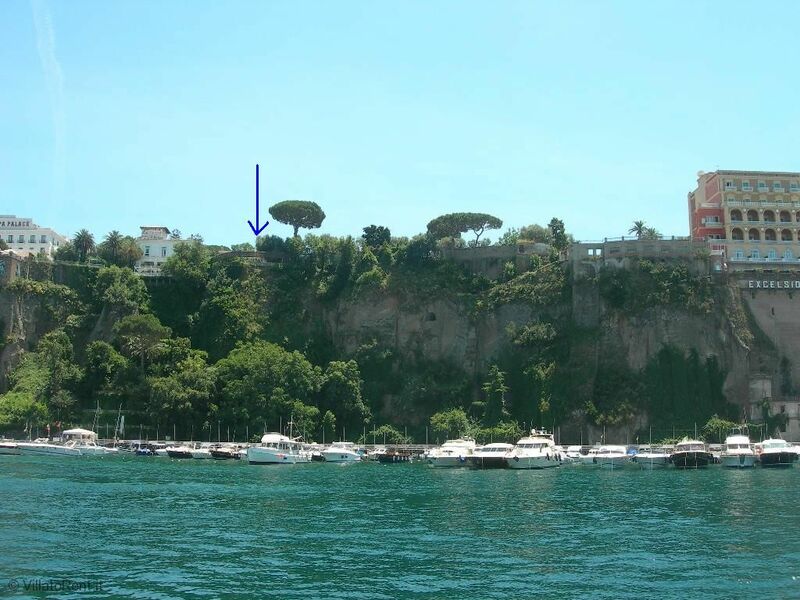 The port is a 15-minute walk away and takes you to Naples, Ischia, Capri, diving and swimming trips and mini cruises. If you are looking for an amazing place to eat or an unforgettable location to visit, just ask Madame Elisa. She is a wellspring of information. Don't miss Ristorante Tasso (Lemon Risotto and out-of-this-world desserts) around the corner from the villa, or Z'intonio in the Via L. de Maio 11 in downtown (Mussels with fresh tomatoes and garlic). 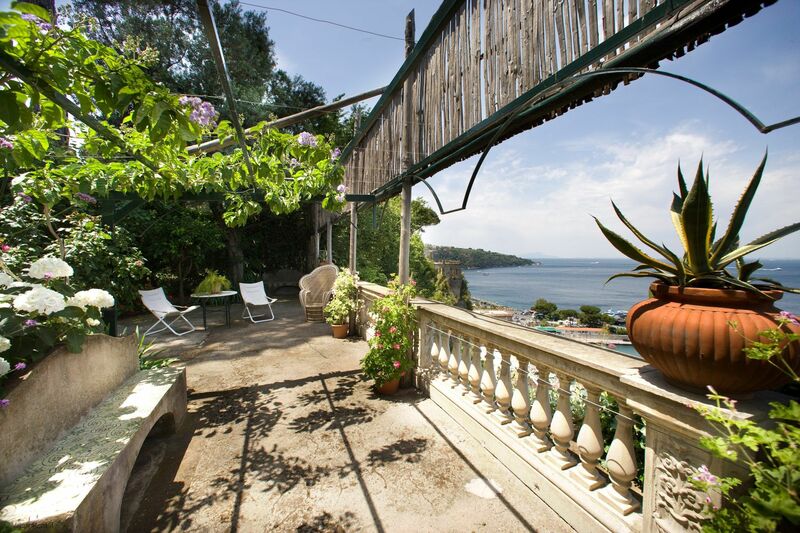 We will recommend Madame Elisa's villa to all our friends and we highly recommend it to you, the reader. 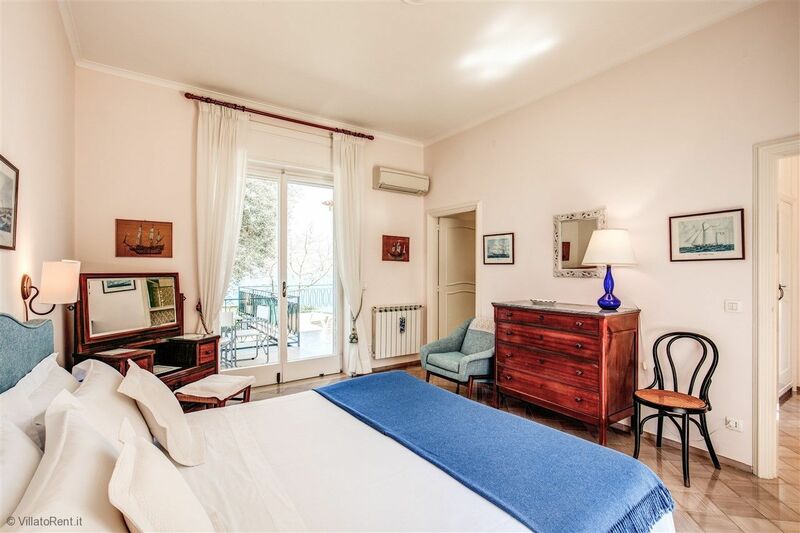 Our two couple travel party thoroughly enjoyed Villa Donna Elisa and were delighted to talk with the owner, Elisa! She was wonderfully helpful and a font of information about the area. 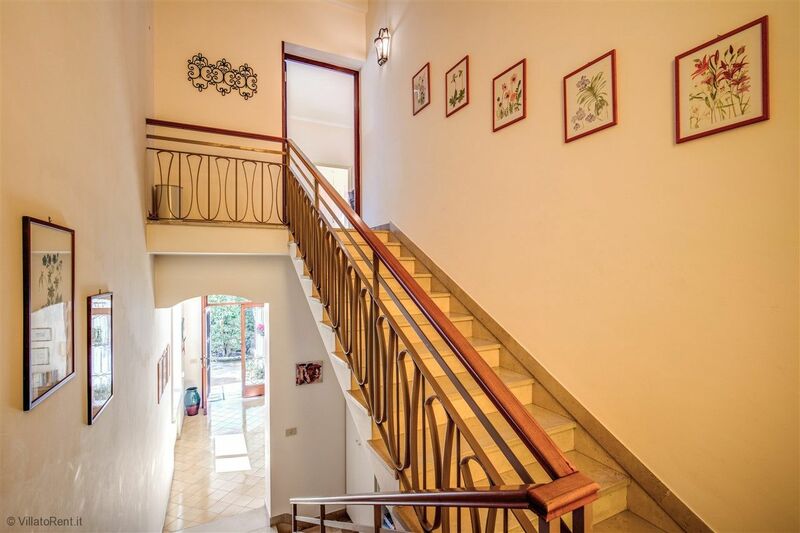 The house is extremely well maintained and relaxing. 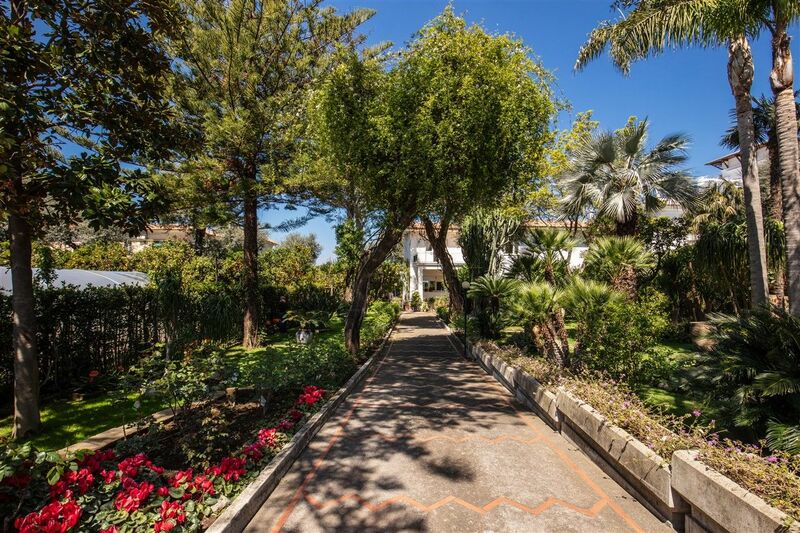 The gardens around the house are magnificent with citrus trees and roses throughout. 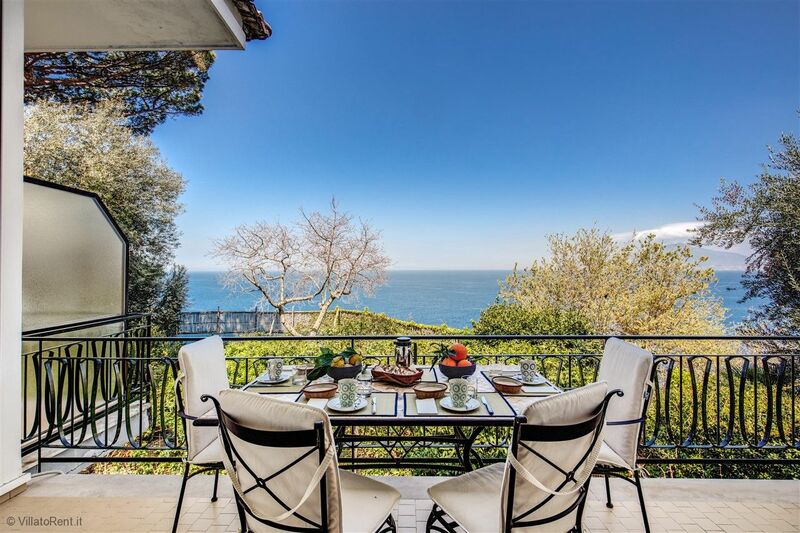 The location could not have been better and the view from the balconies were spectacular! 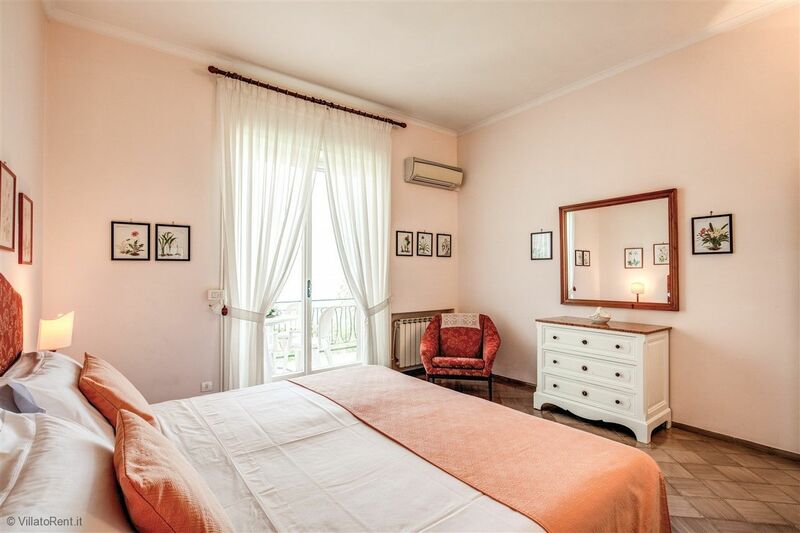 We found Villa Donna Elisa relaxing, convenient, beautiful, and every other word you can think of to describe wonderful! We would highly recommend staying here to all friends and family and hope that we are lucky enough to stay here again in the near future. Elisa made our trip extra special by sharing her knowledge and wonderful personality with us each day! Chuck and Greg, Jim and Rick sincerely thank Elisa for sharing her home with us and making us feel like part of her family! To say that our stay was "delightful" is an understatement. 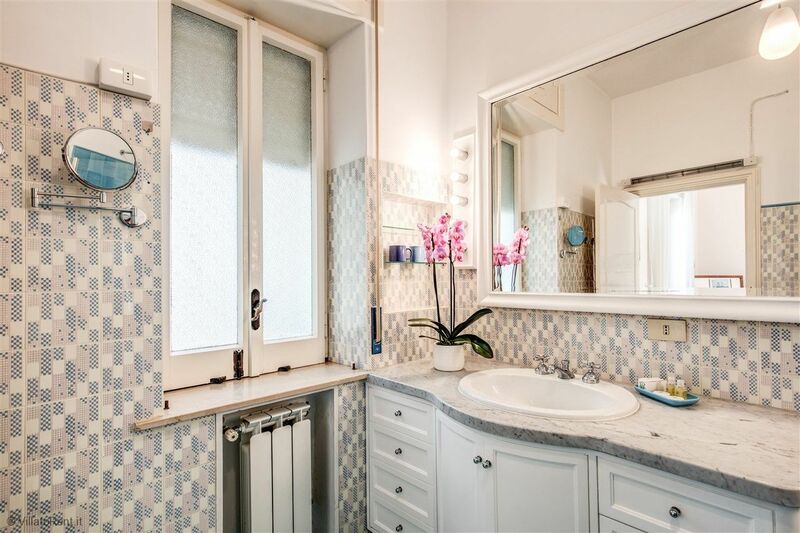 The photos on VRBO were a perfect depiction of Villa Donna Elisa....Madame Elisa was delightful and so very helpful. Her gardens are absolutely breathtaking. 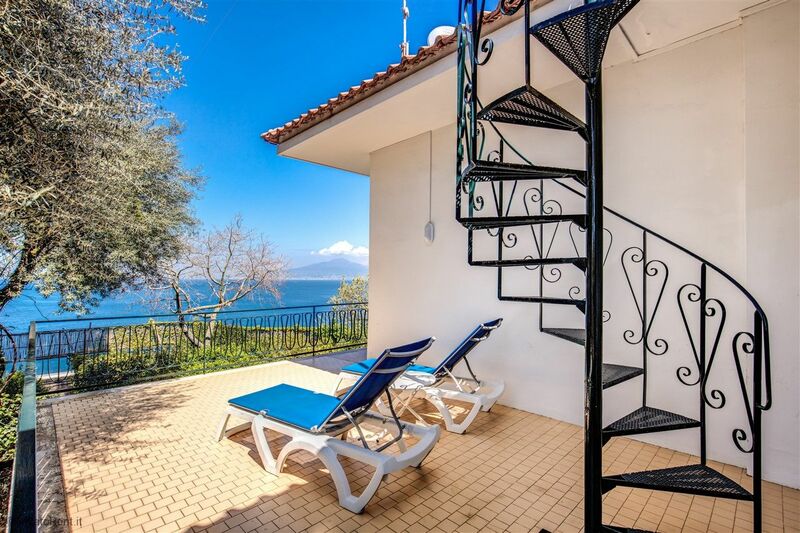 The villa is clean, very accommodating and the view from the balcony was wonderful. We ate our breakfast on the balcony every morning! WOW! The kitchen is well equipped. 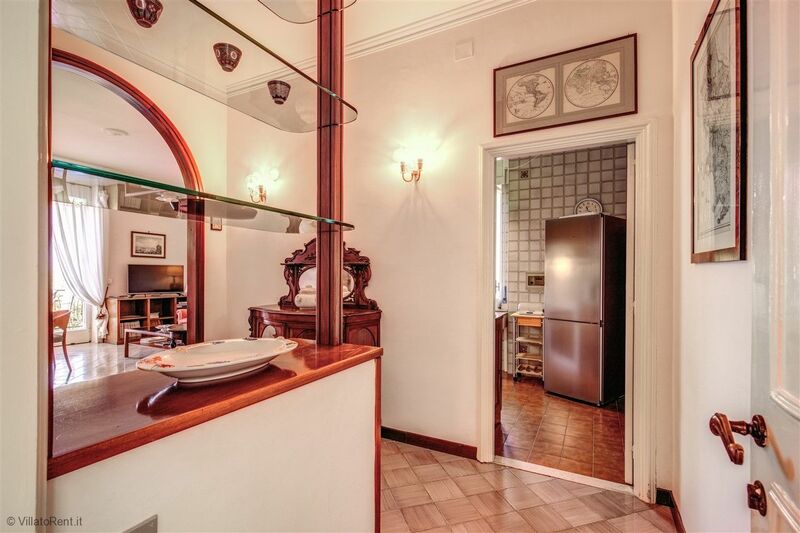 The location is superb - literally a 2 minute walk to shopping, restaurants, grocery, bakeries and GELATO! You can't go wrong with Villa Donna Elisa - enjoy! We were five staying at this beautiful villa in an exquisite setting. The pictures do not begin to do it justice. 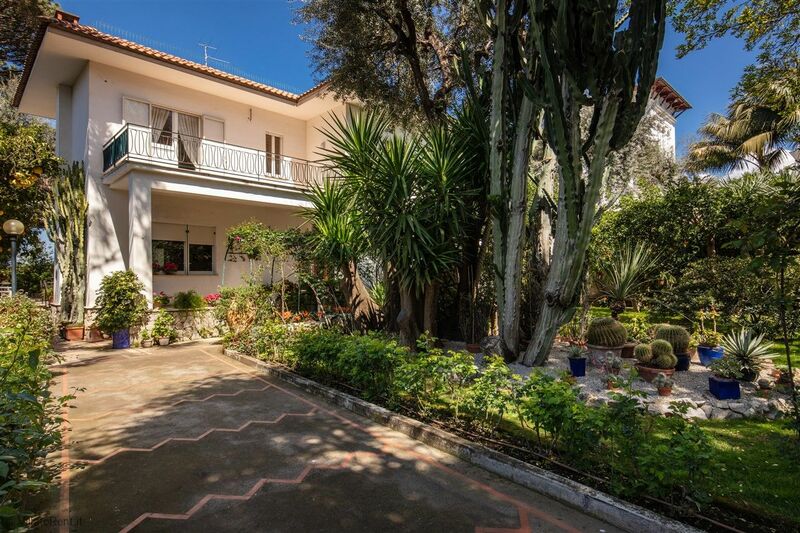 The villa is set on a large property overlooking the marina in the Bay of Naples. 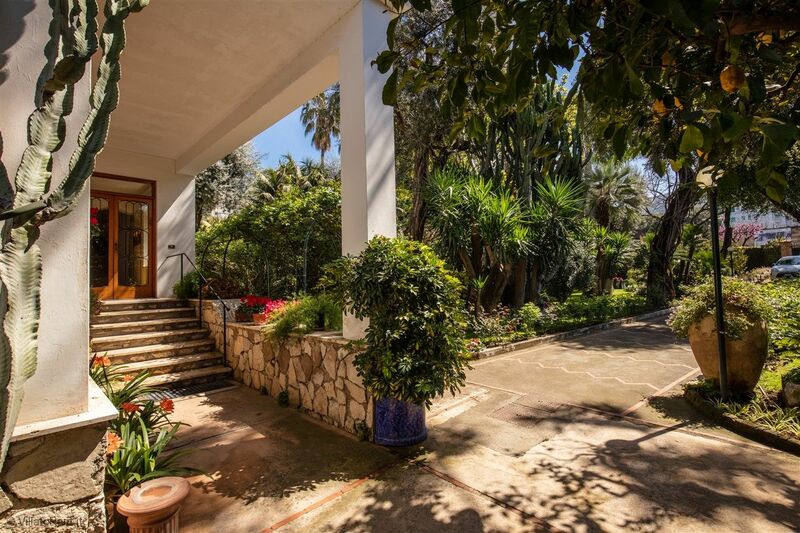 You enter through a gate to find yourself in an amazing garden full of olive, lemon and orange trees. 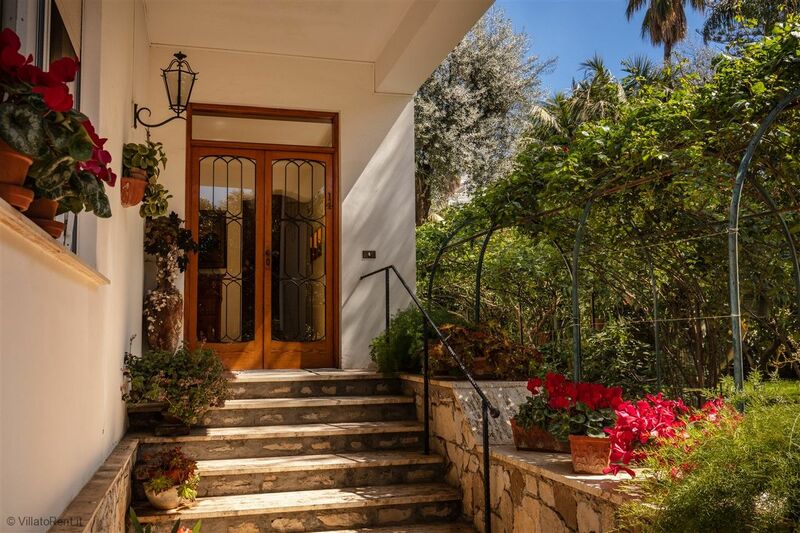 The roses and geraniums are outstanding and the whole garden is very peaceful and quiet, a respite from the hustle and bustle of lovely Sorrento. Donna Eliza, the owner and gardener, is gracious, informative and a well travelled and most interesting, person. 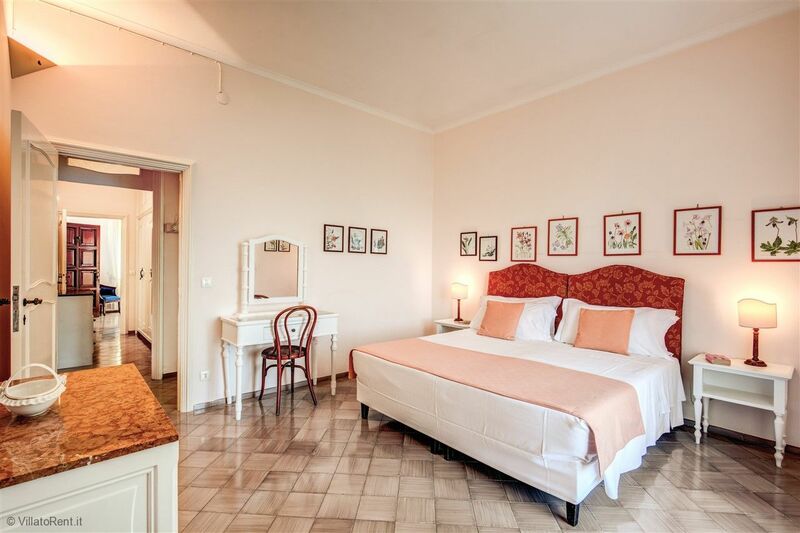 The villa itself is spacious with two large bedrooms with generous ensuite bathrooms. 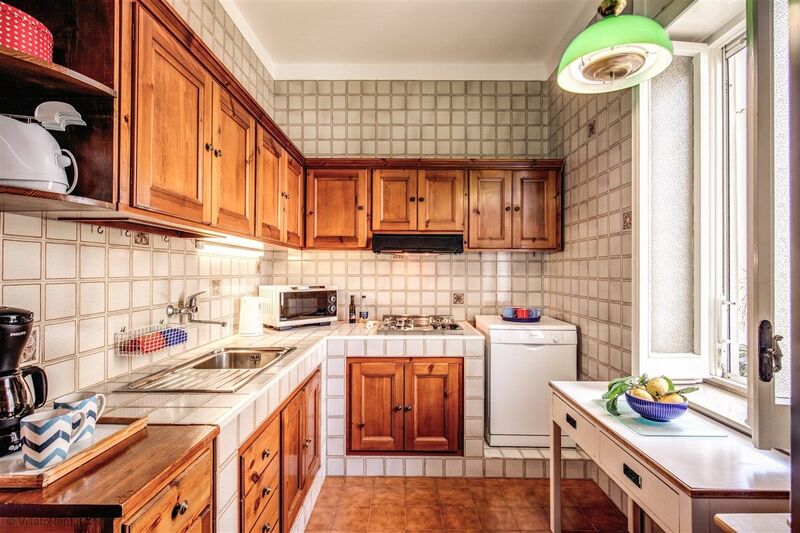 It is beautifully decorated, very clean and well maintained and has a well equipped kitchen. We made all of our meals, choosing to shop for fresh produce in Sorrento. 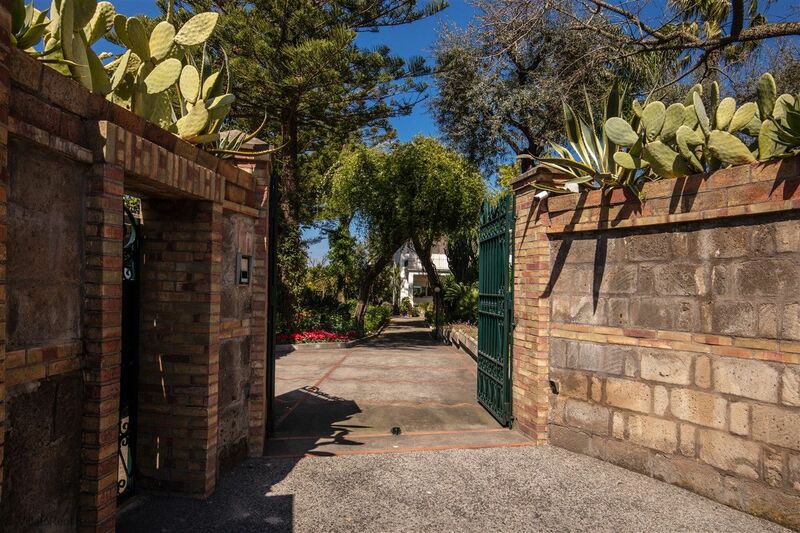 The main street and town square are steps away from the property yet once behind the gated entrance you feel quite secluded. Verandas are off many of the rooms with lovely and comfortable outdoor furnishings. 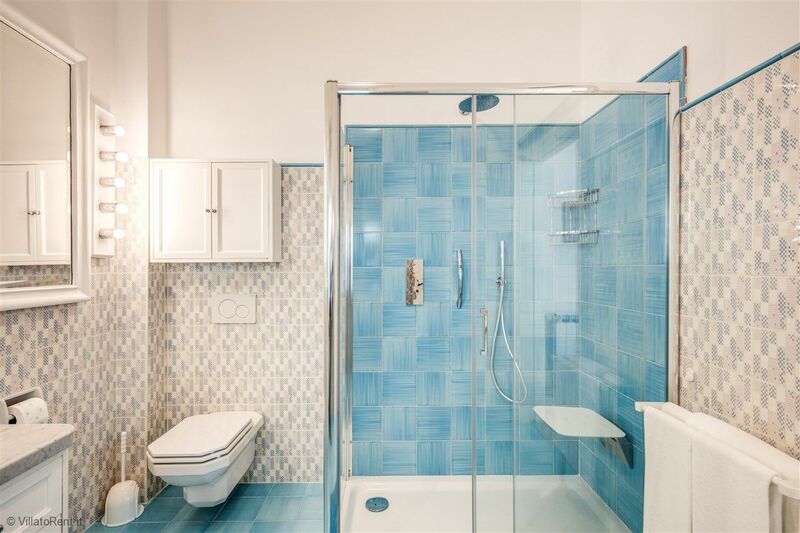 You truly can relax and have ample privacy in this amazing place. We would not hesitate to stay here again; indeed we would make a point of it. 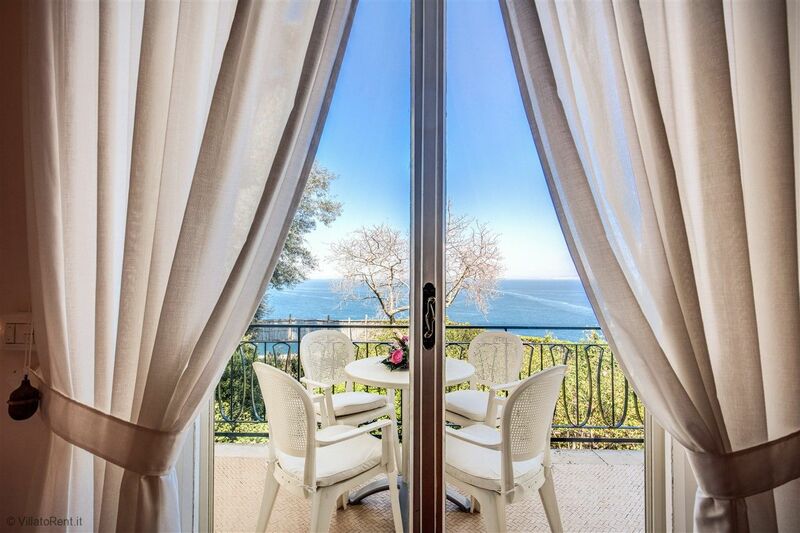 No need to look any further for the right place to stay in Sorrento, you’ve found it. 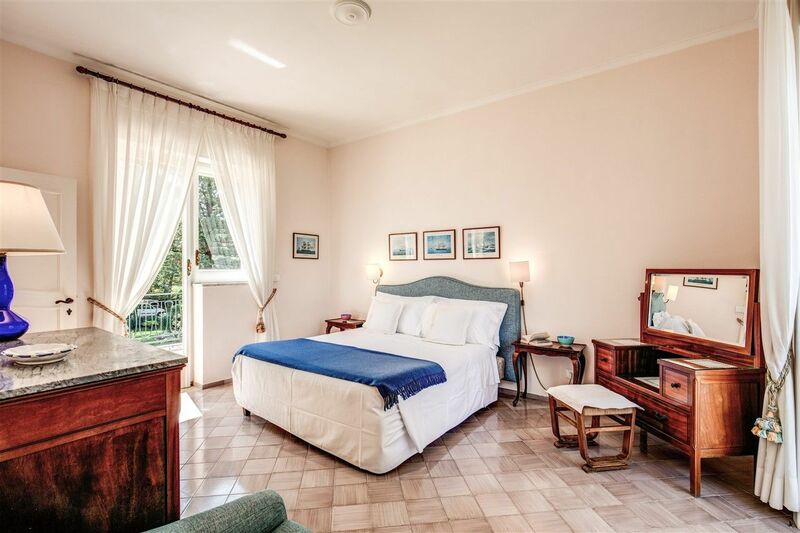 Four of us spent a week in March at Villa Donna Elisa and loved every minute of our stay. 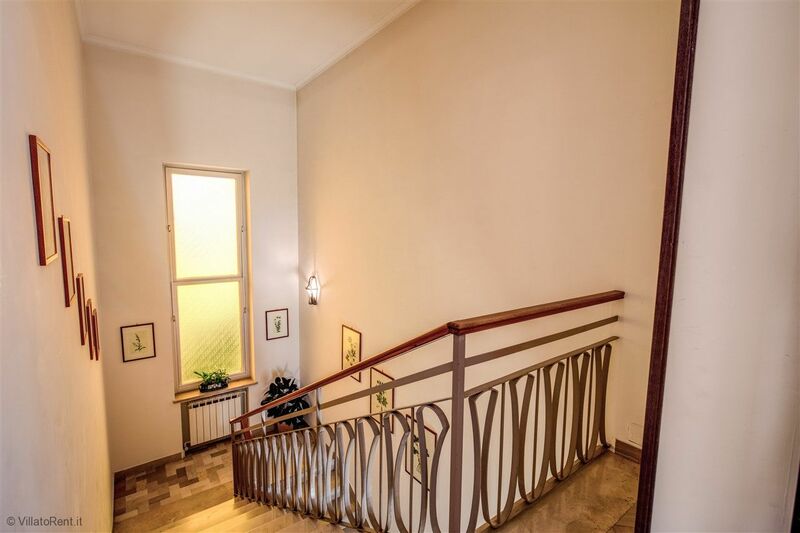 The apartment is spacious and nicely appointed. Owner Elisa is a beautiful women and a gracious hostess, she made our stay all the more enjoyable. 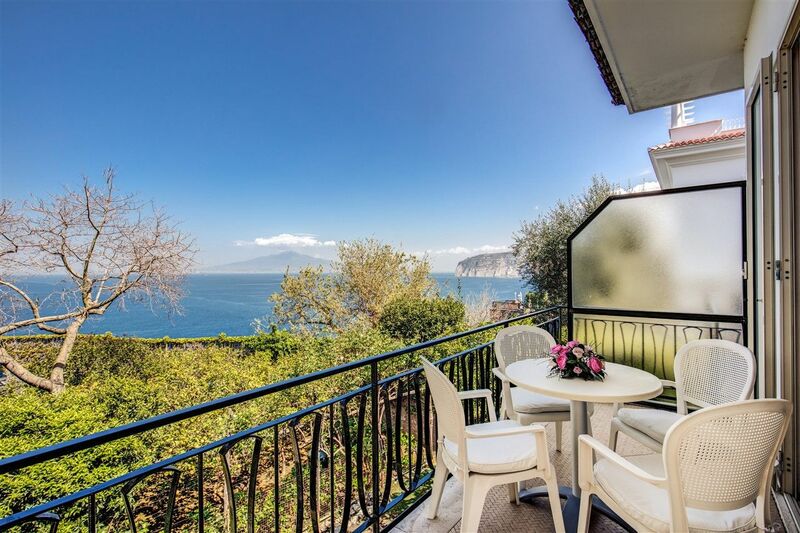 We sat on the balcony looking out to the Bay of Naples, Capri and Mt. Vesuvius and said: "pinch me." It’s like a travel photograph only better. Both bedrooms and the living room lead out through French doors onto a large area and there is even a spiral staircase up to the rooftop. 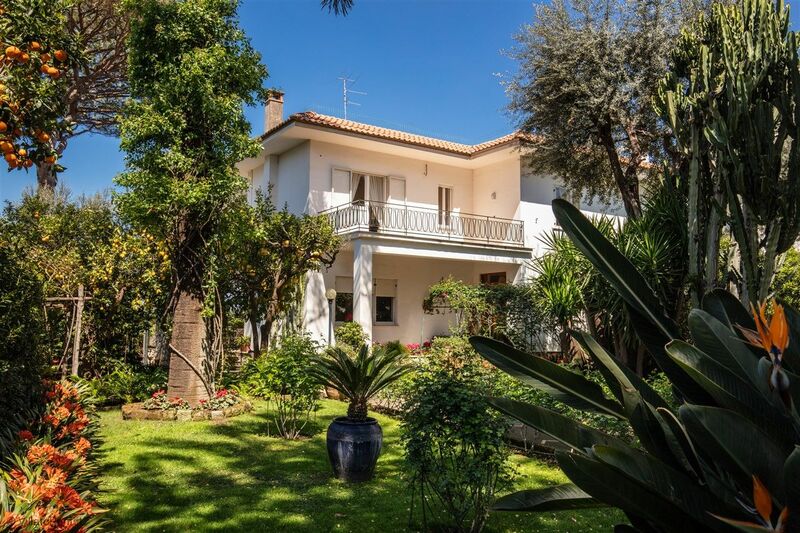 The location is perfect, the view is magnificent, the gardens are abundant with lemons and oranges to eat, the rooms are well equipped, it’s a short walk to everything—train station, town centre, ferry dock, simply everything you need, simply perfect. 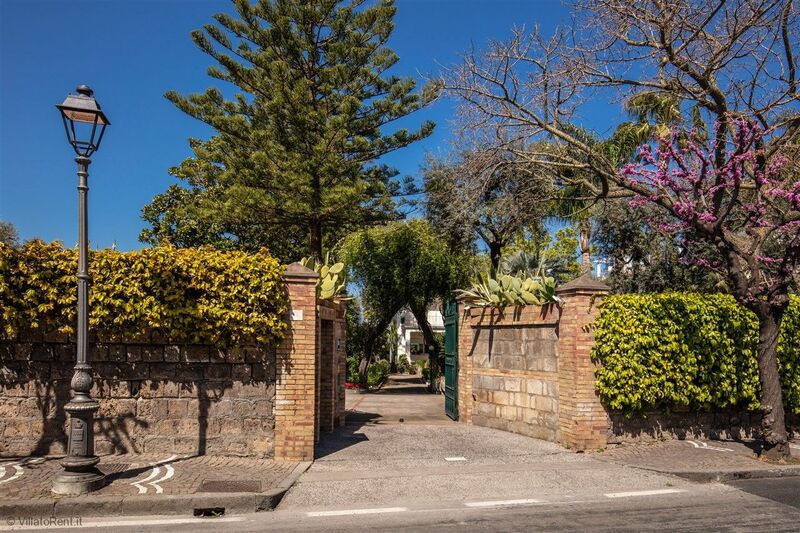 Walking through the gate and leaving the city behind gave us the impression of sharing in the luxury of a private estate. 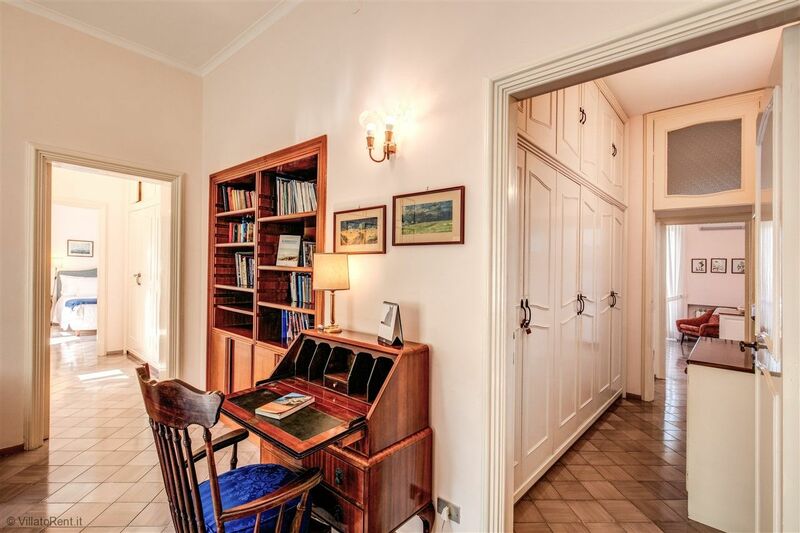 We have learned that British royalty stayed here in this villa – we wondered: which room? Four of us (two couples) stayed here in early March. What a wonderful place! After the hustle and bustle of Florence and Rome, we felt we arrived in paradise. The pictures, if anything, do not do the views justice. The house is magnificent - beautifully decorated with comfortable beds and linens, large bathrooms, multiple decks for enjoying the views. Kitchen is a little small, but we didn't cook much besides breakfast so it worked out perfectly. 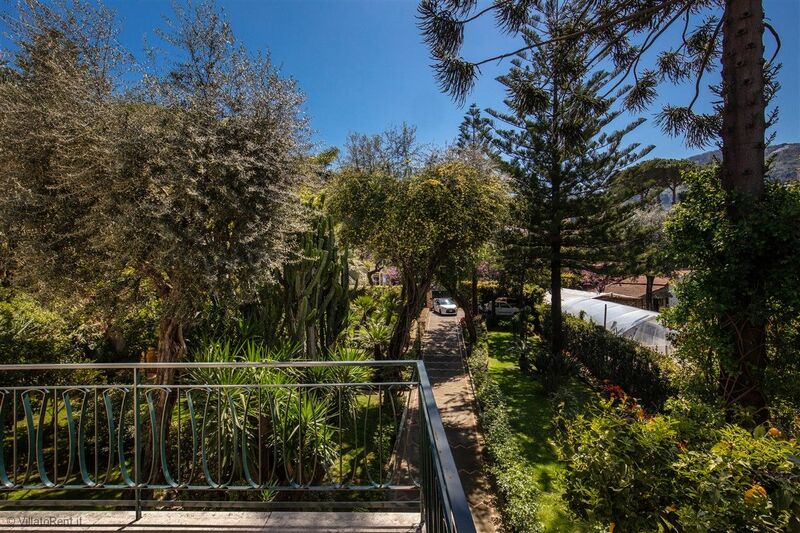 The grounds are magnificent and the views beyond belief! The gardens were just coming to life so there was much activity getting things cleaned up, pruned and planted. The gardens were fantastic without many of the flowers blooming - can only imagine the beauty when everything is in bloom. The house is close enough to walk to town and to the bus/train station and yet is secluded so you feel like you are in the countryside. No need for a car. We had contemplated staying in Positano but decided on Sorrento. 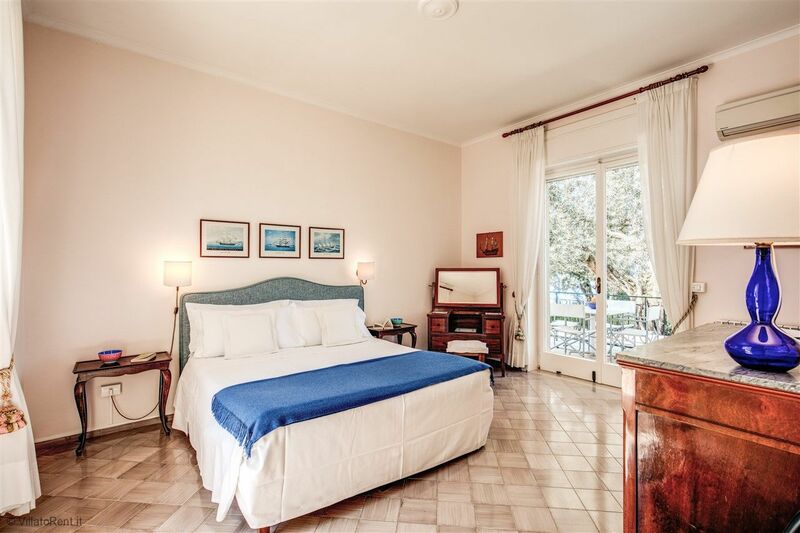 It was the perfect choice - day trips were easily made (bus along the Amalfi Coast, train to Pompeii and Naples, boat to Capri) and Sorrento was large enough to keep us busy and entertained! And the lemoncillo was, of course, beyond wonderful! Liza is a wonderful and gracious host. She has left books in many languages in the bookshelves - from travel to fiction and non-fiction. She answered any questions we had and has led a very interesting life, which she seemed happy to share. A delightful woman! Making arrangements with Bruno were easy and quick also. We had some questions about transport from Rome. He answered almost immediately with options for us. We did not meet Bruno personally but spoke on the phone. Very helpful! We will come back. Of the many places we have stayed on VRBO, this was by far one of our top two! 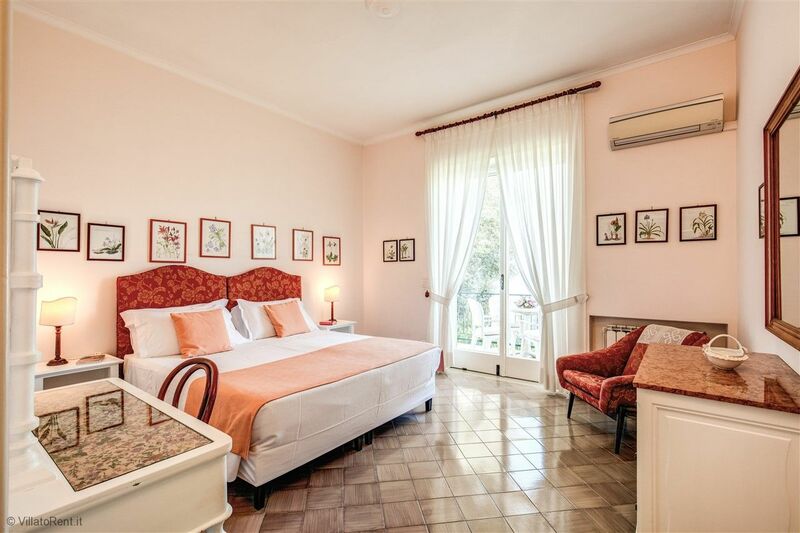 Our stay at Villa Donna Elisa was a week in paradise. The villa was lovely...not only the view, the gardens, the decor, but also the lovely hostess. 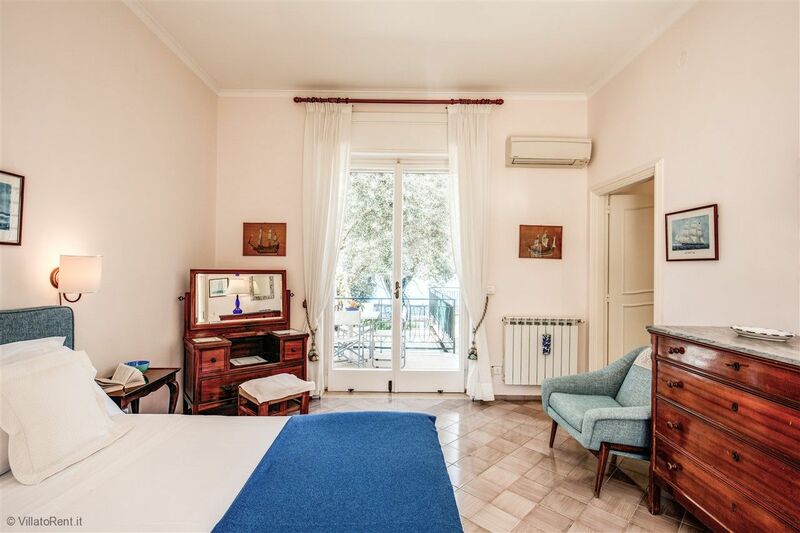 The hustle and bustle of Sorrento was only footsteps away, but we felt tucked away in our own private haven once we walked through the gate. 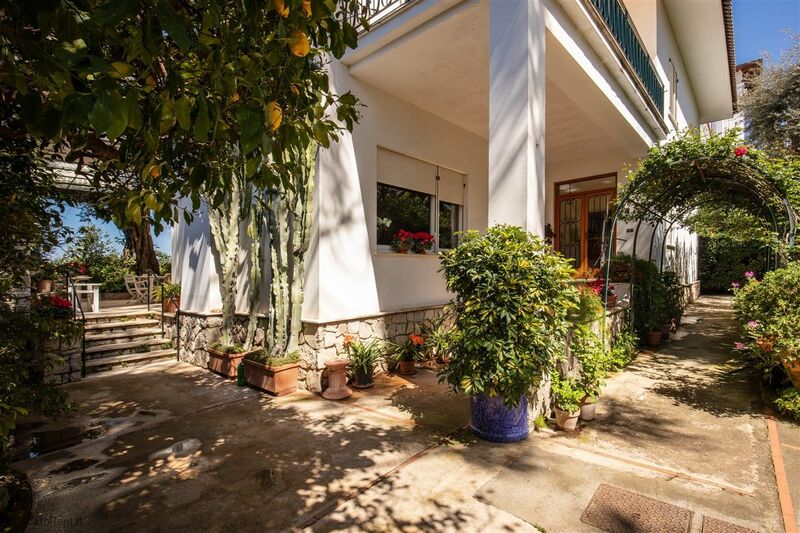 Donna Elisa's home is the perfect spot for a relaxing Italian holiday. 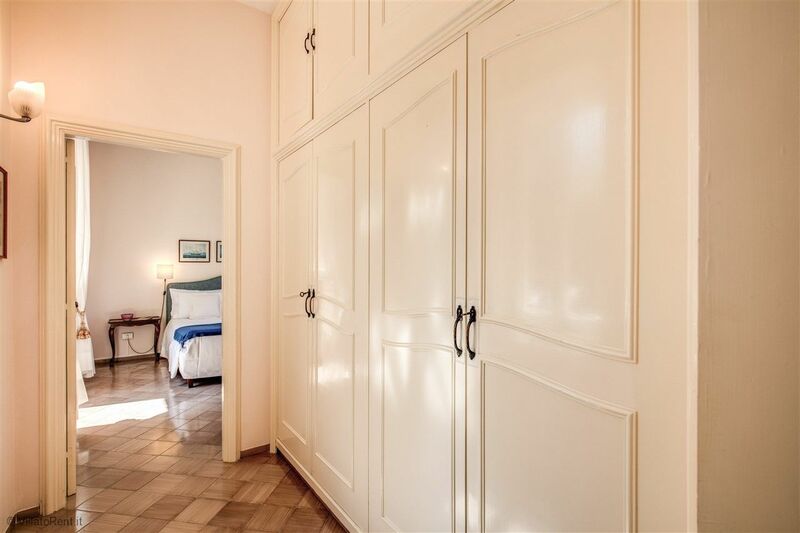 The bedrooms are spacious, the kitchen is well appointed and the living area is comfortable and roomy. 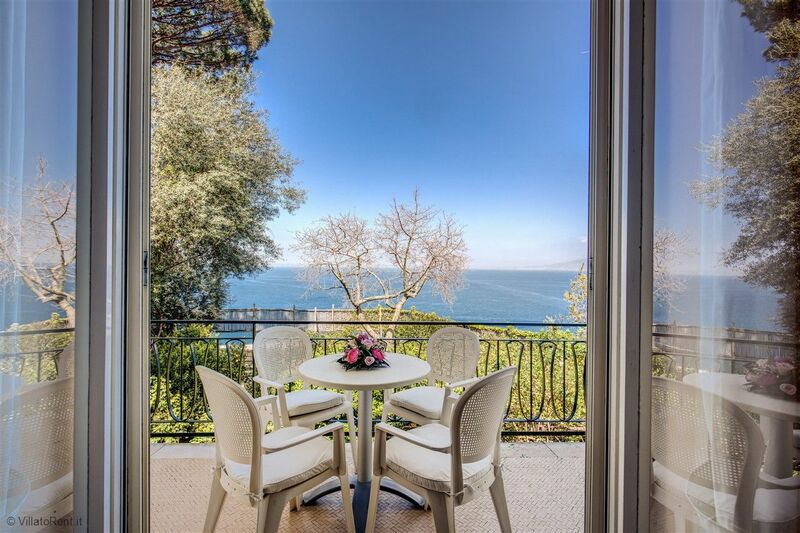 The balcony that extends the length of the villa overlooks her beautiful and unusual gardens as well as the Bay of Naples and Mount Vesuvius. We were fortunate enough to be there during the olive harvest. 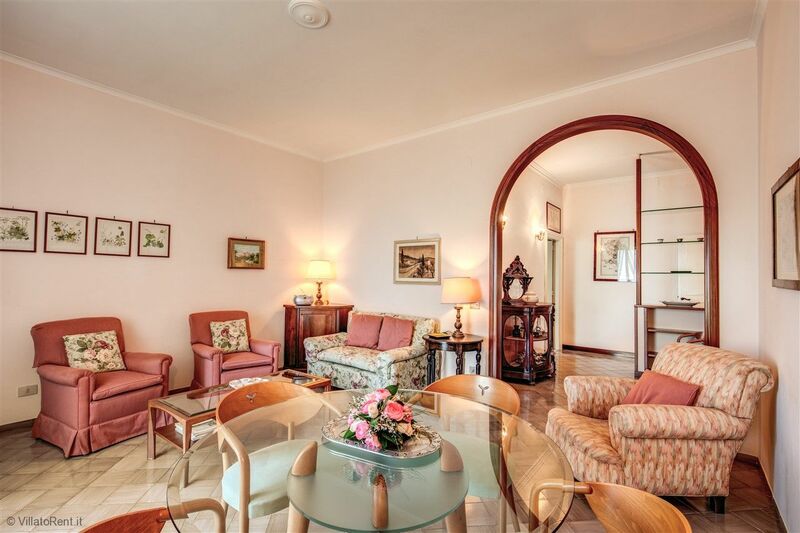 We hope to return to Villa Donna Elisa on our next visit to Italy. Julie and i spent a week at Villa Donna Elisa, along with two friends. 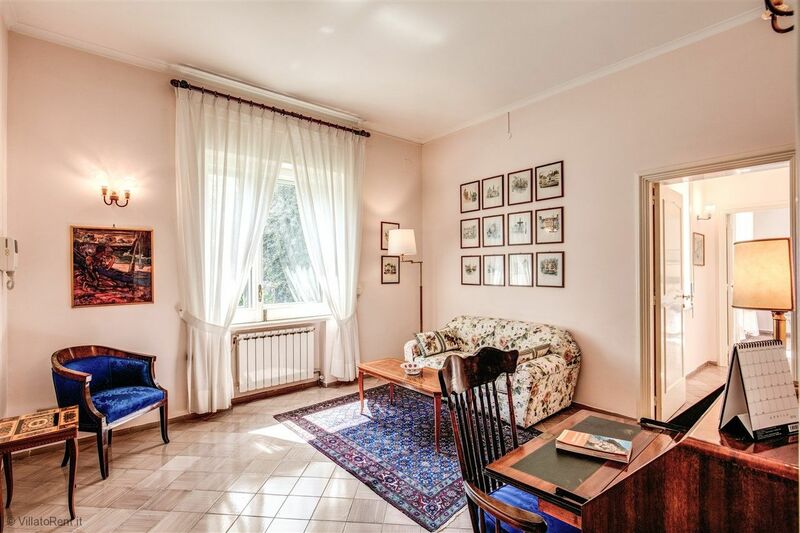 We're all from New Jersey and have traveled together often; Villa Donna Elisa is a great find and a great value - it is a delightful place with tranquility, views, privacy and MMe Elisa's beautiful garden. 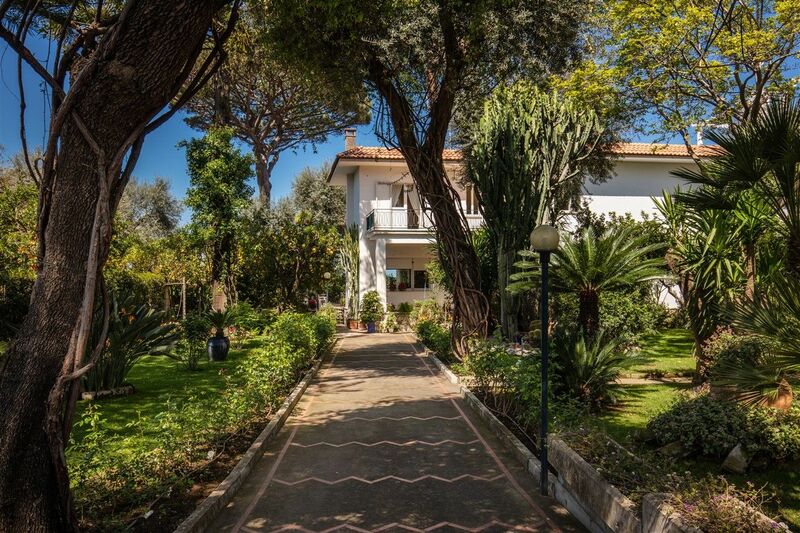 A short walk into town for shopping or dinner and a similar short walk to the train for visits to historic sites around Vesuvius. Cruise ship photo is from the garden. 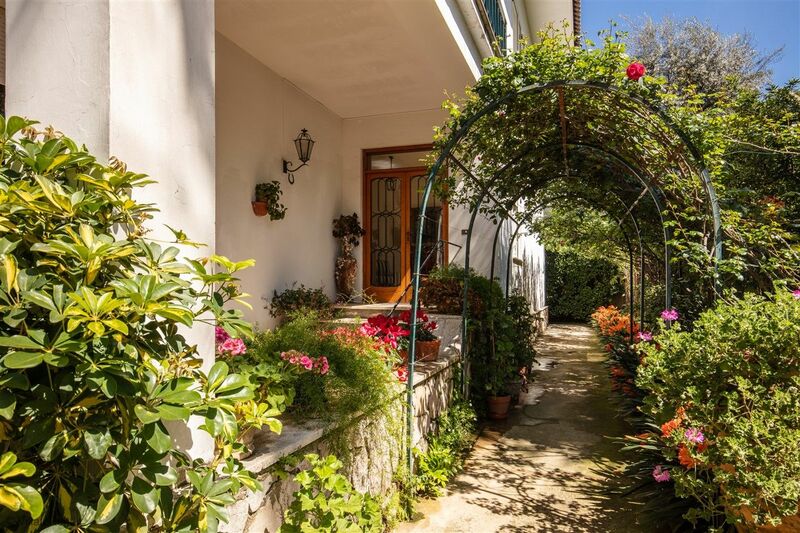 The house is a large stylish building nestling amidst some large and beautiful gardens - which are lovingly maintained, and the trees of which provide cooling shade against the blistering heat of the sun. In the evening the gardens smell gloriously of jasmine. 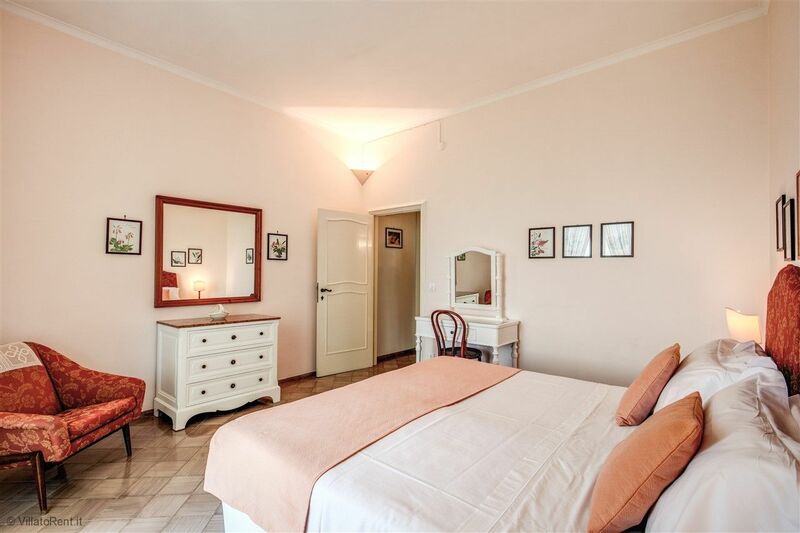 We couldn't believe this lovely complex is all for ourselves, with no other guests. 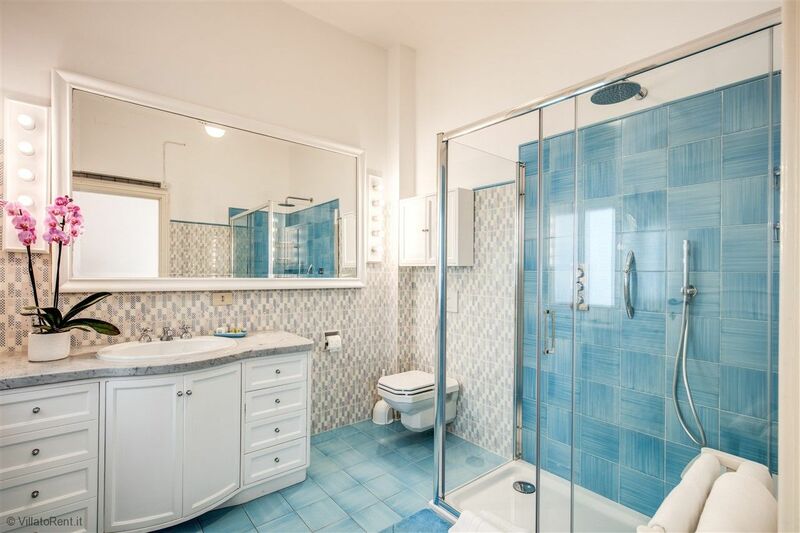 The apartment is large and cool, and is very clean. 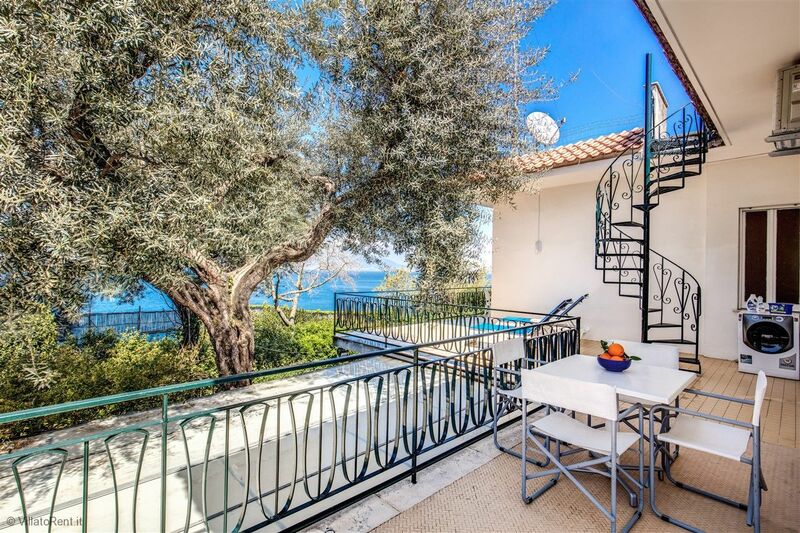 The balconies are perfect for relaxing on, for breakfast, and another one for the evening - you can swap them to avoid the sun as it moves across the sky. 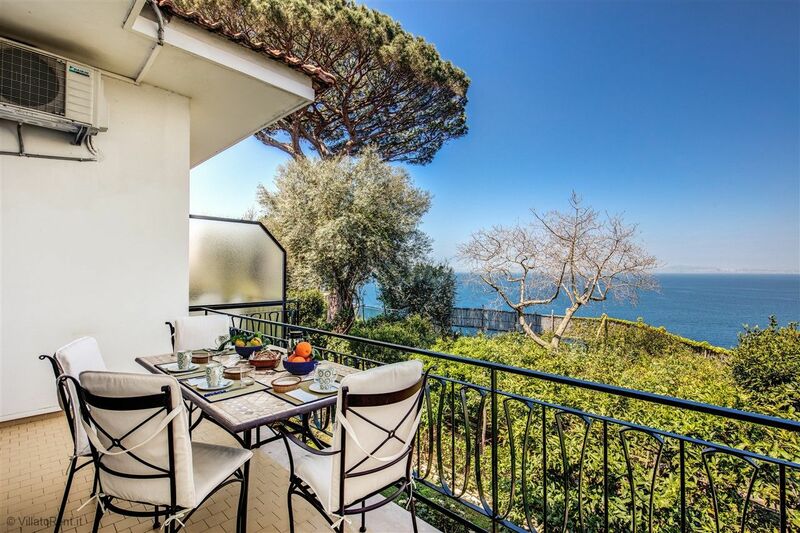 All the balconies have a staggering view over the blue bay of Naples. Quite astounding and breathtaking. Vesuvius looms over Naples in the distance. 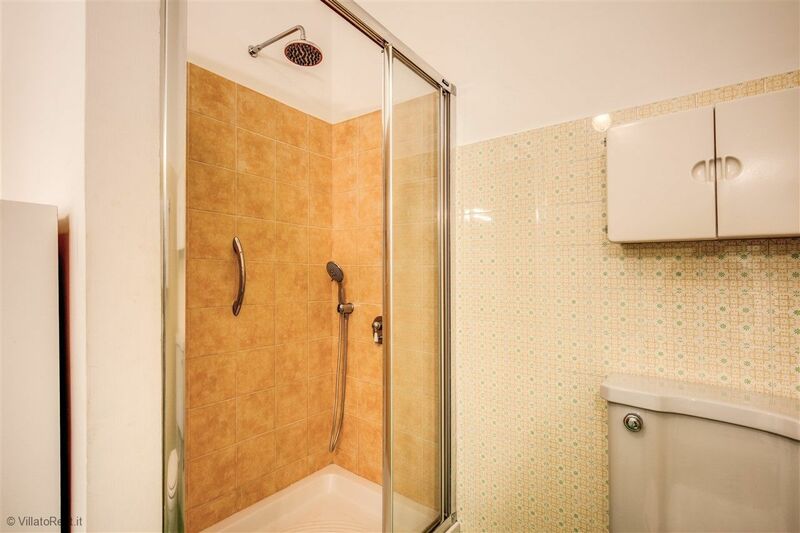 It is very well appointed with all modern amenities, including wireless internet, and Sky tv. 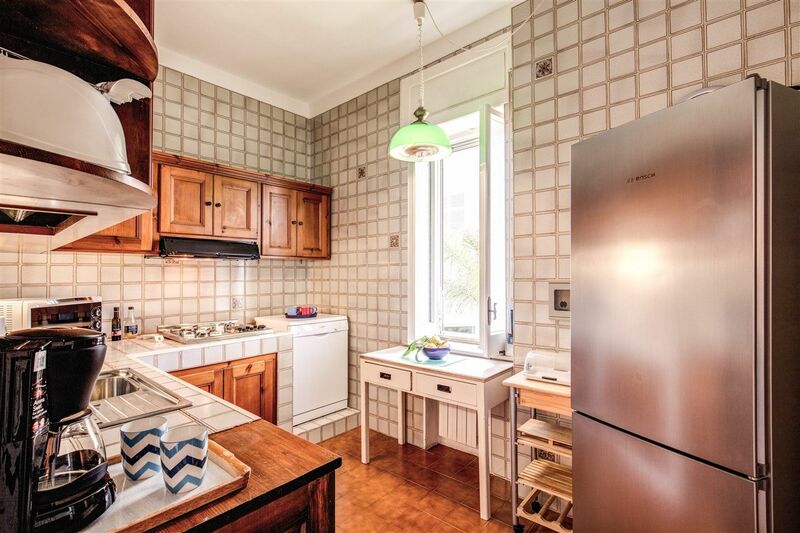 The kitchen has all the cooking tools you could need, including electric filter coffee maker and kettle. 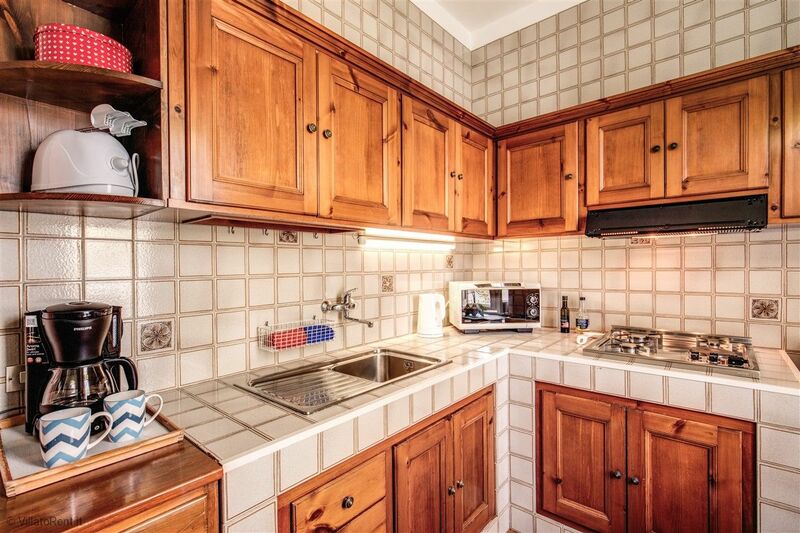 There is also a dishwasher and washing machine. The beds were comfortable and new. At night it is very quiet and peaceful. In the mornings you may be awoken by the sound of cruise ships dropping anchor in the blue bay below. And our landlady and her assistant, were charming and helpful and gave us valuable advice as to how to travel to Pompei and to Naples (to visit the archeological museum there). 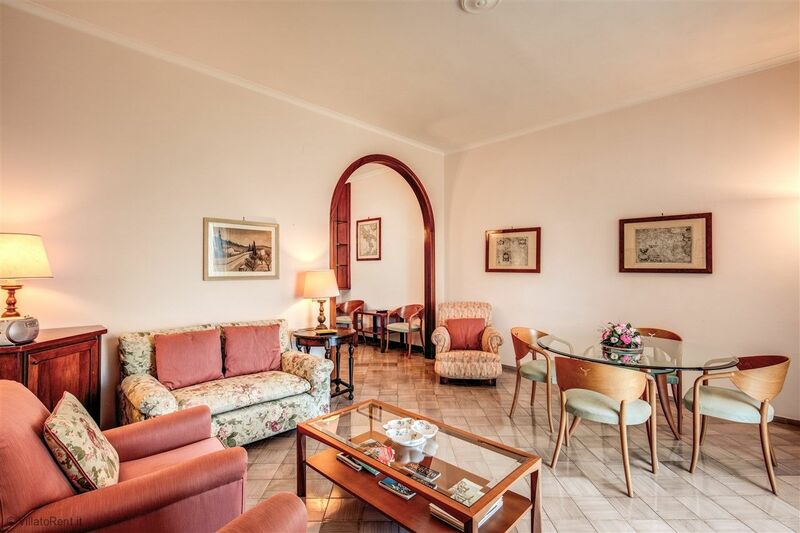 Villa Donna Elisa has everything you would want for your stay in Sorrento. 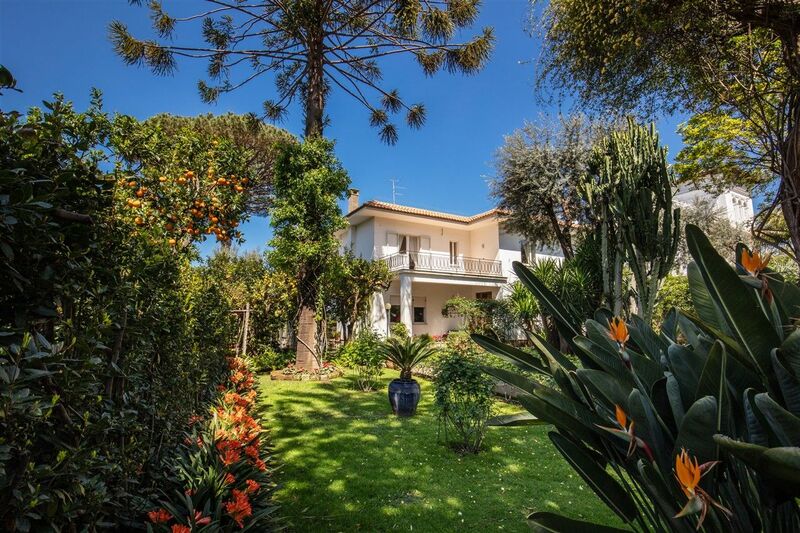 The villa itself is spacious and well-appointed, with a magnificent view of the Bay of Naples and Vesuvius. 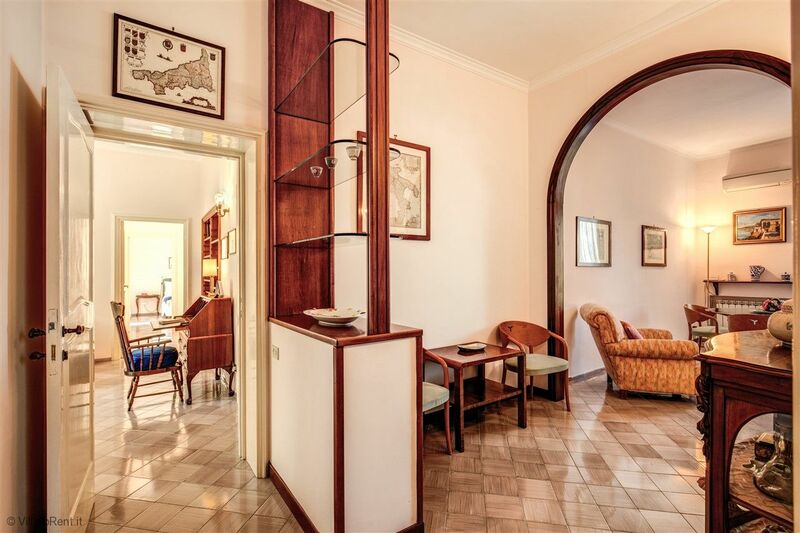 The proximity to Piazza Tasso - Sorrento's center - makes walking a breeze. It is also very close to the train and bus stations. 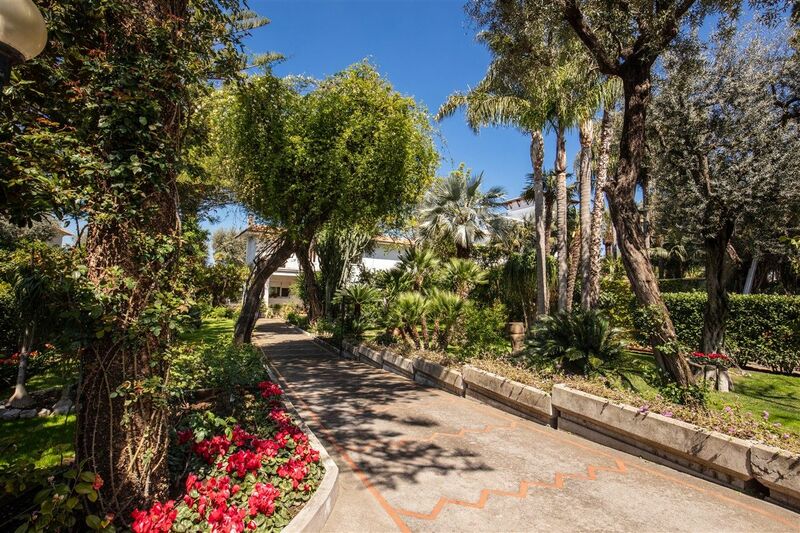 The gardens surrounding the villa create a wonderfully serene landscape. By far the highlight of Villa Donna Elise is Elisa herself!!! She is a kind and gracious hostess and we will remember her fondly.